Photographs of the American West and its inhabitants are a particular strength of the Western Americana Collection, and nearly 7,000 images have been digitized for inclusion in the Princeton University Digital Library. Recently, a box containing twenty 8 x 10 and 5 x 8 glass plate negatives by Charles F. Lummis were digitized for preservation purposes. The library holds over 100 prints by Lummis (available here), and a few of the glass plate negatives are represented in the print collection. The level of detail revealed in the negatives versus the prints is striking. Above are two similar images from a sitting in 1896 (notice the basket in the lower left corner is from a slightly different perspective). In the albumen print, the magazine cover is illegible, while the glass plate negative clearly reveals the title and date: Land of Sunshine: A Southern California Magazine. November, 1895. The Land of Sunshine: A Southern California Magazine. November, 1895. The magazine choice was far from arbitrary: Lummis began serving as editor of Land of Sunshine in 1895 (a position he would hold until 1909). While the publication began in 1894 as a promotional magazine for southern California commerce, Lummis quickly expanded the scope to include ethnographic studies of Native Americans. Lummis also refashioned Land of Sunshine after eastern literary magazines, publishing works by Mary Hunter Austin, Robinson Jeffers, Jack London, and John Muir, and he expanded the geographic scope of the publication to include the entire West (the magazine was later titled Out West). A profile view from the same photo session, titled “A Tigua Maiden,” provides an opportunity for a direct comparison between plate number 691 and a corresponding print. A second direct comparison can be made from plate number 661, titled “Desiderio, The Tigua War-Captain,” taken in 1895. All of the recently scanned Lummis glass plate negatives are scheduled for inclusion in the digital library after the metadata is compiled. In the meantime, below is a set of select images. Watts, Jennifer A. “Photography in the Land of Sunshine: Charles Fletcher Lummis and the Regional Ideal.” Southern California Quarterly, Vol. 87, No. 4 (Winter 2005-2006) , pp. 339-376. —plains—plains—plains / the dug-outs / antelope / the Prairie-Dog / emigrant wagons camped for the night / The vast stretching plains hundreds of miles area / the buffalo grass / the yellow wild flowers / the clear, pure, cool, rarified air (over 3000 ft above / sea level) / the dry rivers. Gordon William Lillie, better known as Pawnee Bill, began his entertainment career in “Buffalo Bill Cody’s Wild West Show” serving as the interpreter and coordinator for the Pawnee Indians. While on tour in Philadelphia, Gordon met May Manning, whom he married two years later, and May’s parents convinced Gordon to venture out with his own western show. His first attempt in 1888, “Pawnee Bill’s Wild West Show,” proved to be a financial failure. His second attempt in 1899, however, “Pawnee Bill’s Historical Wild West, Indian Museum, and Encampment,” found greater success. The combined shows of Pawnee Bill which exhibited here [Charleston] yesterday is first-class in every respect: as a life-like portrayal of savage modes, it has no equals …. The performances of the trained animals were excellent, and equal to any every exhibited in this city. May Lillie’s shooting is wonderful, and the riding and driving of 35 wild mustangs are all grand features. The wild buffaloes and long-horned Texas steers, the grand Mexican Hippodrome races, by senors and senoritas, are most wonderful and exciting. Then the cowboys and Indians retaliated. Some of them drew their revolvers and began to fire, but they either used blank cartridges or fired over the heads of the crowd. Others, however, unslung their lassoes and used them as whips. Some of the Mexican or South American cowboys unslung their bolas and used these with great effect, the leaden-covered ends being exceeding effective. The cowboys charged the crowd several times and rode down those who could not get out of the way. In this manner Elwood Dillon, a colored man, was knocked down, kicked in the head by a pony and his skull fractured. The students were preparing for a lively time to-night when this afternoon President Patton summoned every member of the university to attend a mass meeting. He forbade them to go to the circus to-night, and said that if any student disobeyed him it would be at the student’s peril. Major Lilli [sic], owner of the show, was present and made a speech, which aided in pouring oil on troubled waters. Pawnee Bills Wild West Show lives on today in annual reenactments on the last three Saturdays of June at the historic Pawnee Bill Ranch in Oklahoma: Pawnee Bill Ranch. The photographs of Pawnee Bill’s Wild West Show on Nassau Street are part of the Western Americana Photography Collection, which houses more than 10,000 photographs pertaining to the American West. Nearly 7,000 images in the collection are available online in the Princeton University Digital Library. Below is a gallery of related Buffalo Bill and Pawnee Bill photographs from the collection. Cowboy in Buffalo Bill’s Wild West, ca. 1886. Written on verso: “Col. Wm. F. Cody and Gordon W. Lillie, 1883. Will 37 yrs. Gordon 23 yrs. ‘Clean shaven and hair braided. '” 1883. Brown, Erin Glanville. “Pawnee Bill (Gordon William Lillie, 1860-1942).” Encyclopedia of Oklahoma History and Culture. http://digital.library.okstate.edu/encyclopedia (accessed June 27, 2013). “Pawnee Bill’s Historic Wild West.” Daily Princetonian. May 6 and May 9, 1899. http://theprince.princeton.edu (accessed June 27, 2013). “Princeton Students Riot. They Attack Pawnee Bill’s Wild West Combination.” New York Times. May 16, 1899. http://query.nytimes.com/mem/archive-free/pdf?res=F60D17F6345911738DDDAF0994DD405B8985F0D3 (accessed June 27, 2013). 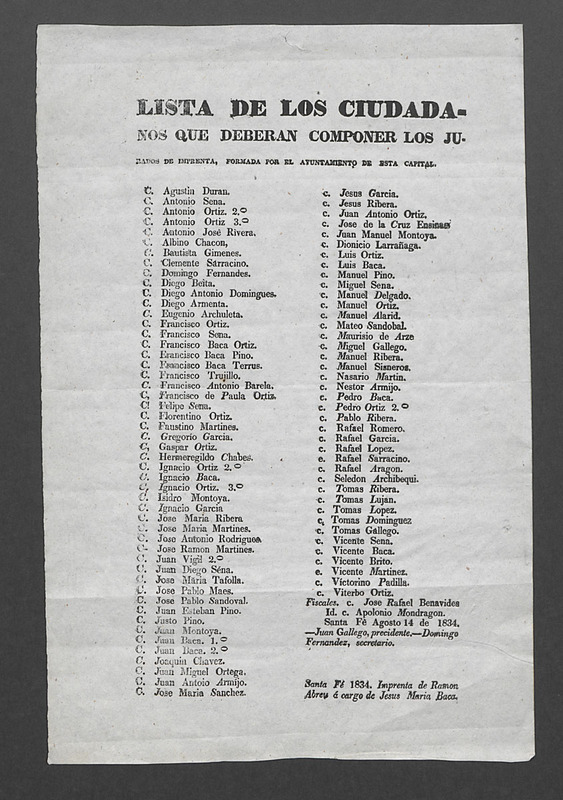 Lista de los Ciudadanos que Deberan Componer los Jurados de Imprenta, Formada por el Ayuntamiento de esta Capital, Santa Fe, 1834. Gift of J. M. Thorington, Class of 1915. The earliest surviving imprint of the press in what is now New Mexico is this broadside: “List of the Citizens Who May Serve As Jurors on Trials on the Press, Made for the Council of the Capital.” It was printed on the “Press of Roman Abreu in Charge of Jesus Maria Baca” and is dated August 14, 1834. The document reflects the 1828 Mexican law passed to protect the freedom of the press and citizens against libel. Lawsuits concerning the press were to be heard by jurors chosen by the municipal councils of every town that supported a newspaper. New Mexico, since its first European settlements in 1598, had seen little need for a press; but the changes wrought by Mexican independence in 1821 and the opening of the Santa Fe Trail to the Anglo-American settlements in the United States quickly made a press and its attendant dangers a necessity. Boyd, E. “The First New Mexico Imprint.” Princeton University Library Chronicle Volume XXXIII, No. 1 (Autumn 1971): 30-40.